The name of this species is related to honey. It is an evergreen Californian shrub about 2m x 1m in captivity. Some of these Californians seem to keep on growing at home and become very big shrubs. Though some of the similar Californians lean towards grey foliage mellifera has green. It has nice whorls of pale blue flowers in spring. Unfortunately I found it tended to have black aphids every spring on the new growth. They are not hard to get rid of but you get spoiled with salvias who don’t often host bugs. Mellifera is frost and drought hardy. 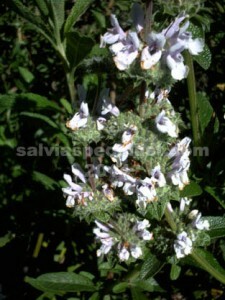 It grows readily from cuttings and sets seed.